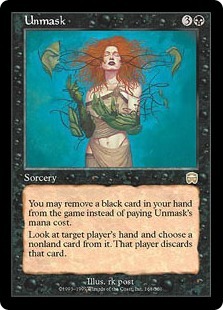 Card Text: You may remove a black card in your hand from the game instead of paying Unmask’s mana cost. Look at target player’s hand and choose a nonland card from it. That player discards that card. Oracle Text: You may exile a black card from your hand rather than pay this spell’s mana cost.